Through creative collaboration with our partners and technology and materials suppliers, we have developed more environmental friendly and energy-efficient products from design to packaging. At the start of product design, we selectively choose low-environmental impact materials that are in compliance with international regulations. In 2017, Accton conducted surveys with our 400 suppliers, pledging them to stop using conflict minerals. All of Accton’s products are 100% compliant with the requirements of EU RoHS Directives (2002/95/EC, 2011/65/EU), and we have never had a return due to RoHS violations. For components that contain RoHS restricted substances, we ask our suppliers to provide alternatives in advance. We also ask suppliers to reduce the use of common plasticizers, such as DEHP, BBP, DBP… etc. beforehand. Accton is fully compliant with REACH regulations (Registration, Evaluation, Authorization and Restriction of Chemicals; No 1907/2006/EC). According to the REACH directive requirements, if a product contains Substances of Very High Concern (SVHC) greater than 0.1% (w/w), relevant information about the SVHCs contained in the product should be provided to customers. The EU ECHA official unit added 7 SVHCs on 2018/01/15, so there are a total of 181 SVHCs. We added the new SVHCs on 2018/02/01 to Accton’s restriction list. We demand that suppliers disclose information about the new SVHCs in addition to the old ones, and encourage them to be excluded. Additionally, we have also added the hazardous substances from Annex XVII of REACH regulations to the Control Standards for Accton Hazardous Substances (document no. QPC-CE05). All components, modules, and materials used are in full compliance with a list of restricted substances specified in the Control Standards for Accton Hazardous Substances (document no. QPC-CE05). The restrictions are not only limited to the 10 substances regulated by the EU RoHS (Restriction of the use of Hazardous Substance’ Directive 2011/65/EU), but also includes items regulated by international environmental law and our global customers. In addition, we have built a sustainable supply chain information management platform, called the eGreen System, which incorporates sustainable materials from the beginning of product design and significantly improves the reliability of sustainable products and the verification processes. In 2015, we updated the platform with the list of restricted substances and sustainability requirements for our suppliers, expanding the system’s function. 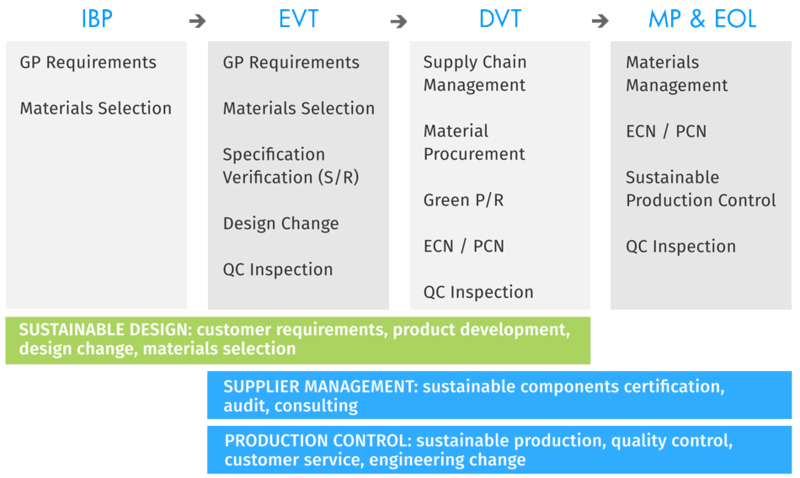 In order to effectively track, communicate, and manage sustainable components, every supplier can learn the latest regulations of the Control Standards for Accton Hazardous Substances (QPC-CE05) on the newly developed eGreen system (a sustainable supply chain information management platform), and commit not to provide eco-destructive substances. On Dec 29, 2017, we hosted supplier meetings in Shenzhen, China and declared our determination to fulfill global criteria for environmental protection and quality management. Accton has informed our suppliers that we do not support or use conflict minerals. In Q2 2017, we conducted conflict mineral surveys with more than 400 suppliers across China (South China and coastal area), North America, and Europe, requesting suppliers to pledge to stop using minerals controlled or sold by armed groups. Our suppliers were required to trace the metals and the source from their upstream smelting mines and refining companies of their respective industries, and fill out a CMRT survey form from the CFSI’s latest announcement. By doing so, Accton has been making sure our products are conflict free from the source origin of the materials we use.